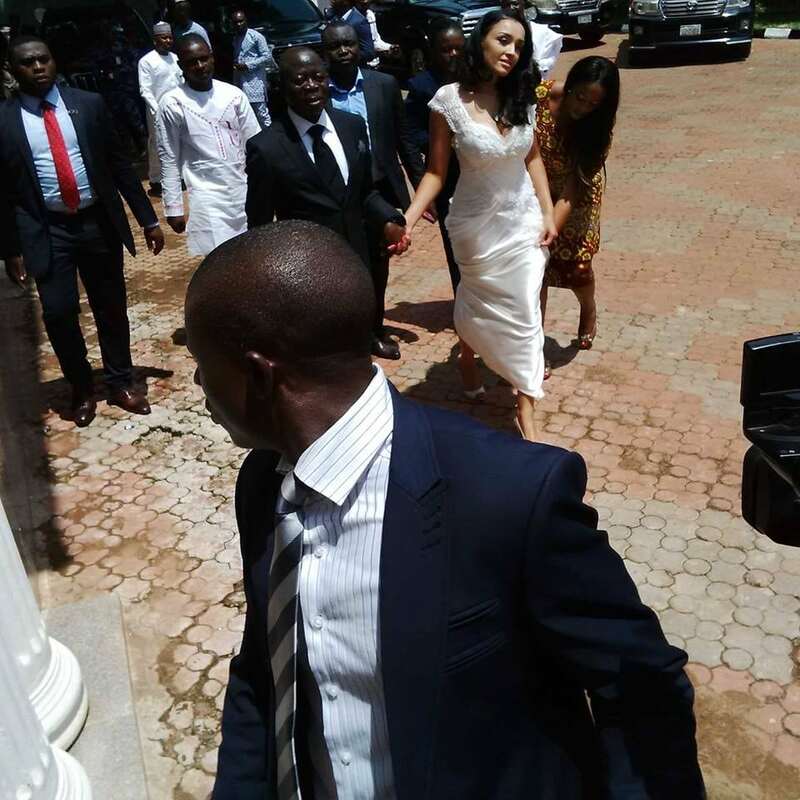 See the wedding of Edo State Governor, Comrade Adam Oshiomole that everyone is talking about. Some people called it child abuse, others call in love. What do you think about it? 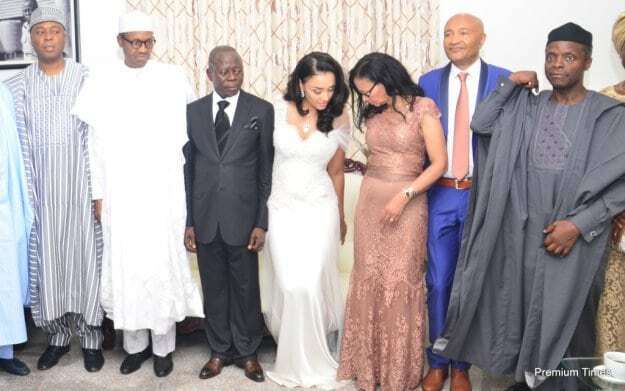 Premium Time (Edo State) – It was glitz, glamour and a list of who-is-who in the country was in attendance as Governor Adams Oshiomhole of Edo State, Friday, exchanged marital vows with his heartthrob, former Miss Lara Fortes. The governor and his bride signed the dotted lines at a private marriage registry attended only by family and a few friends at his Iyamho residence after which top dignitaries in the country were led by the President-elect, Muhammadu Buhari, to the wedding reception held at the People’s White Hall in the governor’s country home. Among other top dignitaries who also graced the ceremony were the Vice President-elect, Prof Yemi Osinbajo and his wife Dolapo. All Progressives Congress’ chieftains were led by its National Chairman, John Odigie-Oyegun; governors and governors-elect across the country, Senators Bukola Saraki, Domingo Obende and a host of others and Senators-elect from across the country were also in attendance. Speaker of the House of Representatives, Aminu Tambuwal led members of the House of Representatives and incoming ones to the wedding reception. Captains of Industry, who were led by to the ceremony by Aliko Dangote, included Jim Ovia, Femi Otedola, Noggie Meggisson, Hosa Okunbor, among others. Royal fathers were not left out as they attended the ceremony in their numbers. The Oba of Benin was represented by high ranking palace chiefs who include David Edebiri, the Esogban of Benin Kingdom. The Inspector-General of Police, Solomon Arase, former Governors Kayode Fayemi, Oserheimen Osunbor, Senator Tunde Ogbeha; Osaigbovo Ogbemudia, Niyi Adebayo were also in attendance. Top military brass, including Brigadier-General MJ Abel, Commandant, Nigerian Army School of Electrical and Mechanical Engineering, Auchi, were also in attendance. The Director-General of the State Security was represented by Joseph Oworuya, while Mr Bello Bakori, Director, SSS Edo State, was also at the ceremony. Parents of the bride, Mr and Mrs Fortes flew in from their home in the Netherlands to attend the ceremony while the governor’s mother, Aishetu Oshiomhole, was also in attendance. The governor’s children Steve, Adams, Jane and two of his grandchildren were also on hand to show love and support for their father and his wife. The governor’s marriage is coming about five years after the painful death of his first wife, Clara, following a protracted battle with cancer. Lara, a lawyer by profession and top model, is from the Cape Verde Islands. She is a former staff of Emirate Airlines, and is in her early thirties, aides of the governor say. The chairman of the ceremony, former Head of State, Yakubu Gowon, said the governor’s wife completes and complements him and he admonished the couple to show true love and have patience in their dealings with one another.